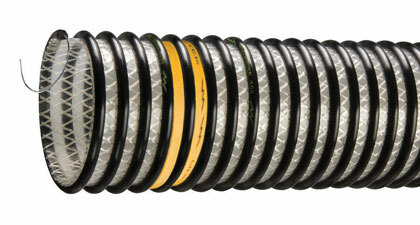 New Voltbuster™ VLT-SD™ Series hose by Tigerflex™, features an innovative design which effectively dissipates static to ground, helping prevent static build-up and reducing the potential for dangerous electrostatic discharges when transferring powders, pellets and other granular materials. The hose tube is constructed from highly abrasion resistant, food grade polyurethane. Fabric reinforcement provides extra strength for suction and discharge. The grounding wire is encapsulated in a rigid helix on the exterior of the hose, safely eliminating the risk of contaminating the transferred materials. Click here for more info.